Thor the Dark World: What’s The Verdict? I loved the first Thor movie. I really did. I was well prepared to like this one. That’s why I was slightly disappointed when I left the movie theatre a few days ago. It wasn’t a bad movie. It just wasn’t as good as the first. Since I like putting my best foot forward, let’s start on what was good. None of the acting was necessarily bad. The effects were really good, and they flowed naturally with what was actually there. I also liked the fact that the dark elves were made up with good old fashioned grease paint and colored contacts. The music was good, the fight choreography was as well. Loki, Darcy, and Frigga stole the show for me. Their performances made the movie much better. I won’t tell any spoilers, but Tom Hiddleston had a particular scence that had me laughing out loud. He also gave Loki a new demension that showed what the pre-going evil Loki was like. Rene Russo also gave an excellent performance of the mother of Thor and Loki. I got the feeling that she truly wanted them to be a family again. Kat Dennings as Darcy once again added a light touch to a gritty action-packed feel of the movie. Now on to the not so fun part, the bad news. Chris Hemsworth showed us the same Thor, albeit a little love sick. If Mr. Hiddleston was able to show the new facet of Loki, why couldn’t Mr. Hemsworth do the same? Natalie Portman was the same. Jane Foster was so strong in the first movie, and she’s supposed to be a genius, why couldn’t she try to control (or harness) the Aether? If Malekith (a guy who just came out of a millenia-long snooze) could know what to do with it (without it killing him) couldn’t she? Also, the ending was forcibly rushed. I couldn’t (as a person of average intelligence) really understand how they defeated the villain. I think it was the fact the Dr. Selvig was running around without pants on that distracted me, but I figure that a person of average intelligence should be able to understand a little bit of how the bad guy was defeated. Now a bit for the parents in the audience. Now that the ratings scale for movies has changed to allow the F-bomb in movies, if a film maker wants to get into the sweet spot (PG-13 that is) they have to put in a great deal more “content”. Darcy locks lips twice with her “intern” and Jane and Thor share a few smooches as well. Thor has a shirtless scene that really doesn’t add much to the story. One of the warriors three has two women who hang about him at a party. One of which sits on his lap. Jane’s temporary boyfriend says that one of the reasons he broke up with his former girlfriend slept with other guys. Erik Selvig is seen running around naked on tv (he’s pixelated in certain areas) and he walks around in his underwear in another scene. The movie has its fair share of violence, but it’s about the same level as what you would see in the Lord of the Rings, Pacific Rim, etc. There are 2 uses of sh– and a few uses of d— and H—. God’s name is abused a few times. Asgardians love their drink, and this is shown at a party. Jane and whats-his-name (thor’s substitute) order wine. Erik Selvig has a great deal of medication to take (but doesn’t) and tosses it into a trash can at the nearest oppertunity. 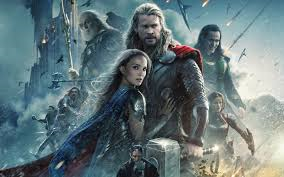 All in all I give Thor: The Dark World a 7 out of 10. It’s good enough to buy on DVD or Blu-Ray when it comes out, but unless you really want to spend an arm and a leg, don’t go see it in theatres. Tell me what you guys think. I love comments. Stay wierd people!